It may come as a surprise to many in white America that ethnic cleansing is not particular to Nazi Germany, Rwanda, or Bosnia. American history shows that many communities here are guilty of it too. These communities banished their black citizens—often violently. Many of these communities remain virtually all white to this day. Brothers Charles and James Brown traced their family tree to Pierce City, Missouri, and learned that their ancestors had been forced out at gunpoint. 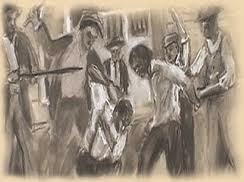 Marco Williams produced a documentary titled Banished: How Whites Drove Blacks out of Town in America.